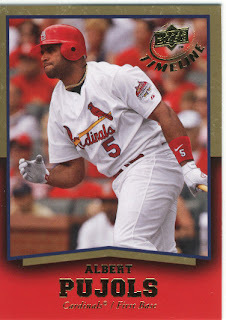 Here is the story of the 2008 UD Timeline Albert Pujols Gold Card I said I had, and it's a doozy. I finally got this card in the mail the other day. I won it over 60 days ago, and I know this because it will not show up in my eBay. The card arrived in a bubble mailer, penny sleeve and top loader. There was also a note inside the package, which I should have kept to scan, but I threw it away. The note was an apology for the delay in shipping and that the seller has had a lot of family problems and was very neglectful to his business and certain parts of his life, and that all PayPal claims and negative feedback were definitely deserved but he wants to keep his customers and sent everything out anyway. Now, I filed a claim with PayPal a long time ago, got my dollar back and moved on. Then the card arrives months later with this note, and I am not sure what the point of this whole thing was. I think it was a very nice gesture on the part of the seller to still send out the items he promised people, but I think I could have done without the novel. A simply apology would have been sufficient because now it kind of looks like he has been drumming up a story. Then again, why would someone go through the trouble of dreaming up all that to send to people while sending them essentially free items. At any rate, all I know is I got a card I needed and I am happy. I did not leave him negative feedback, at least I don't remember doing so. Poor Albert has been on a long journey and will be placed in his home shortly. Has anyone else had this happen? This is a first for me on eBay in all the years I have been buying and selling. We had two verrrry bad experiences (over a couple of years) and now will only deal with 99.9 or 100 percent positive feedback sellers who also have low shipping charges. For some reason, this combination seems to be a safeguard against nuts and novels. I've had two bad card-buying episodes on eBay. First was this seller, who at the time, had 100% positive feedback. Within a week, she had fallen to 90%. Lots of cards not getting sent out. Worried, I emailed, and no reply. Repeat, lather, rinse. I finally filed a claim, and voila -- response. "The card is in the mail." I received it a week later. The other just shipped cards in toploaders without sleeves, and then in PWE, and charged $4. I wasn't happy! And all the subsequent posts about it. I haven't tried to collect 2008 Heritage since that incident and I can't even bring myself to look at them. I bought some High Number series cards and I just have them put aside. The whole attempt to collect that set was a complete failure and left a bitter taste in my mouth. I'm waiting on 2 cards that I purchased before Christmas. One of the sellers did e-mail me and said there were some problems with the post office, but the item was now on its way. The other seller has not said one word about his delay. I know 2-3 weeks is not that long, especially around the holidays, but when other wins come 2-3 days after paying, I get suspicious. This happened to me about two years ago--I was actually selling an old ipod hard drive that I had removed and the guy who bought it was 100% and all that. I contacted him right after the auction about payment...and again 5 days later...and at 7 days--at which point I got assurance that he would pay me "this weekend". A week later, with still no payment I sent him another email. He responded with a long sob story about how his job and family situation had changed and he couldn't buy it and he understands if I give him negative feedback blah blah blah (all for like a $9 item). So, I relist the item and give him negative feedback. His response is up in a day, giving me negative feedback too and saying that I didn't pay attention to "changed circumstances." Jerk. Sounds like the case of Timeline we ordered a while back. Seller had good feedback, everyone was happy. As time went on, his feedback was dropping every week.... The time of release came around and we waited about 2 weeks or so before we got the case. 2 weeks and Sooz sent about 40 emails in the meantime trying to get a response out of him and it took til after the PayPal claim was filed to get a response, and even that wasn't quick.